Carya cordiformis is a tree to 18 m tall, 60 cm dbh (Petrides 1988), may live 200 years (Burns and Honkala 1990), slow growing; growth pattern strictly determinate (Marks 1973; Gargiullo personal observation); deeply taprooted, roots associated with ectomycorrhizal fungi (Decker and Boerner 1997). 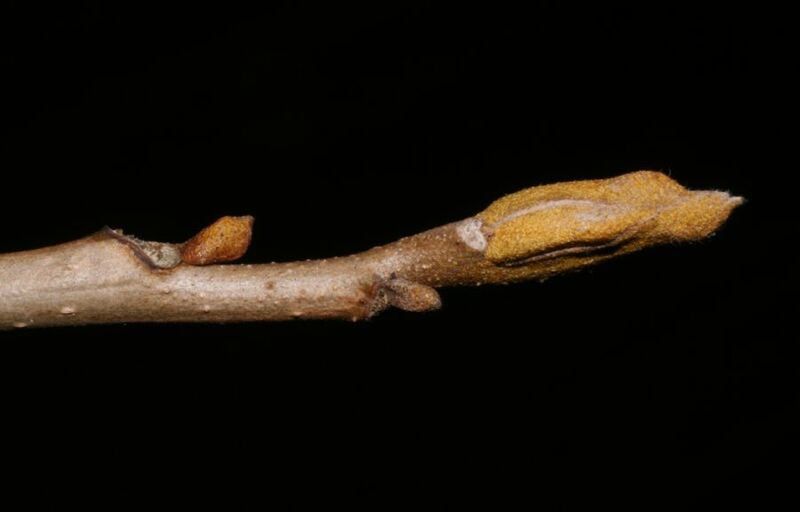 Ectomycorrhizae, which form a sheath-like structure around small roots, are formed mostly by basidiomycetes; twigs slender; bark tight; winter buds bright yellow, narrow, appearing naked, scales not overlapping (Harlow 1946). Leaves alternate, to 30 cm long, pinnate-compound, leaflets mostly 7-9, 5-15 cm long (Little 1985) lance-shaped to elliptic, margins toothed, slightly hairy below, terminal leaflet wedge-shaped at base and more or less stalkless (sessile), generally tending to be smaller and narrower than those of the other 3 common hickories in NYC (Gargiullo, personal observation). Fall color deep yellow. 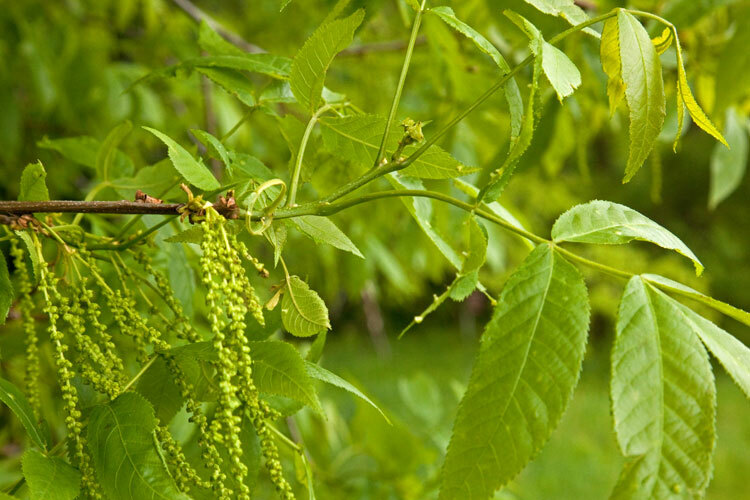 Carya cordiformis (bitternut hickory) flowering branch. Bob’s Brain on Botany. 10 May 10. bobklips.com (Accessed 12/2017). Flowers with sexes separate, (monoecious), males in dangling catkins, female at ends of twigs small, green, wind pollinated; blooms April-May. Fruit to 3.5 cm, oval to round, winged or ridged above middle, husk thin, splitting to the middle, nut beaked, kernel bitter, Sept.-Oct. Seeds dispersed by mammals that bury nuts. Nuts eaten by many mammals and some birds (jays, crows, pheasants), flowers and bark eaten by a few birds and mammals (Martin, et al., 1951). Nuts germinate after cooling period. Carya cordiformis (bitternut hickory), pistillate flowers. Bob’s Brain on Botany. bobklips.com (Accessed 12/2017). Frequency in New York City: Frequent. In general, hickories are not dominant trees, usually growing as scattered individuals or small clusters of parent and offspring in oak dominated forests. Carya cordiformis winter bud. www.plantsystematics.org (Accessed 7/2014). Habitat: Wet, moist, sometimes dry undisturbed forests in soils from pH 4.8-7.4 (USDA, NRCS 2010). Moderately tolerant of shade, (index 5.8), flooding, drought, and soil compaction. Sensitive to salt. Stump sprouts if cut. Susceptible to fire. Phellinus igniarius commons.wikimedia.org (Accessed 12/2017). Notes: Fungi often infect fire wounds, especially Phellinus igniarius (Fomes i.; Basidiomycotina; Hymenomycetes), heartwood rot. The fruiting body is a common polypore bracket fungus with a thick, blackish, fissured cap, often with a white margin when young and brownish pore surface. 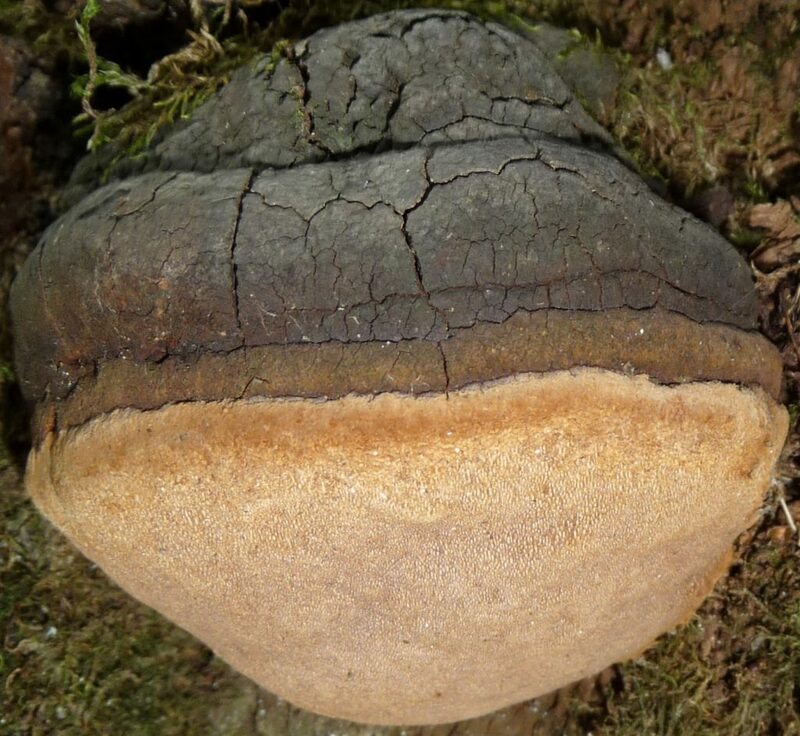 Other fungi infecting hickories include: white heart rot or perennial canker caused by Poria spiculosa (Phellinus s.; Basidiomycotina, Hymenomycetes); the leaf spot Gnomonia caryae (Ascomycotina, Pyrenomycetes) an anthracnose that causes round brown spots to 2 cm diam., surrounded by yellow, spots can coalesce, killing leaflets prematurely (Hightshoe 1988; Agrios 1988; Sinclair et al. 1987). Host to larvae of the hickory hairstreak butterfly, Satyrium caryaevorus; the banded hairstreak butterfly, Satyrium calanus, (Lycaenidae); the luna moth, Actias luna; the polyphemus moth, Antheraea polyphemus; the royal walnut moth (hickory horned devil), Citheronia regalis, (Saturniidae); the fall webworm, Hyphantria cunea (Arctiidae); and the non-native gypsy moth, Lymantria dispar (Lymantriidae); (Pyle 1981; Covell 1984; Tallamy 2003; Gargiullo, personal observation). 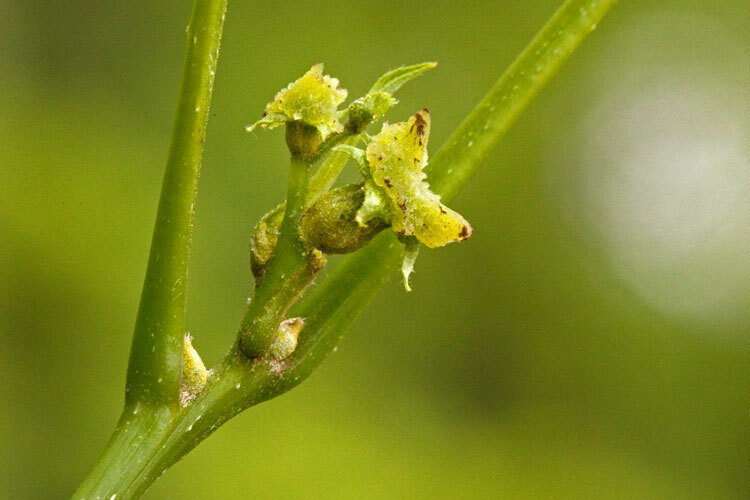 Leaves and wood are attacked by the gall maker (Caryomyia holotricha). One of the most damaging insects attacking hickory is the bark beetle Scolytus quadrispinosus (Coleoptera, Scolytidae). Adults feed on leaf stems and twig crotches. They lay eggs under the bark and larvae create galleries by eating the living inner bark layers which can kill the tree. The galleries have a diagnostic shape of a centipede with very long, thin legs. Another very damaging insect is Goes pulcher, the hickory borer (Coleoptera, Lamiinae). Larvae damage the trunk by tunneling in sapwood and heartwood of young trees. 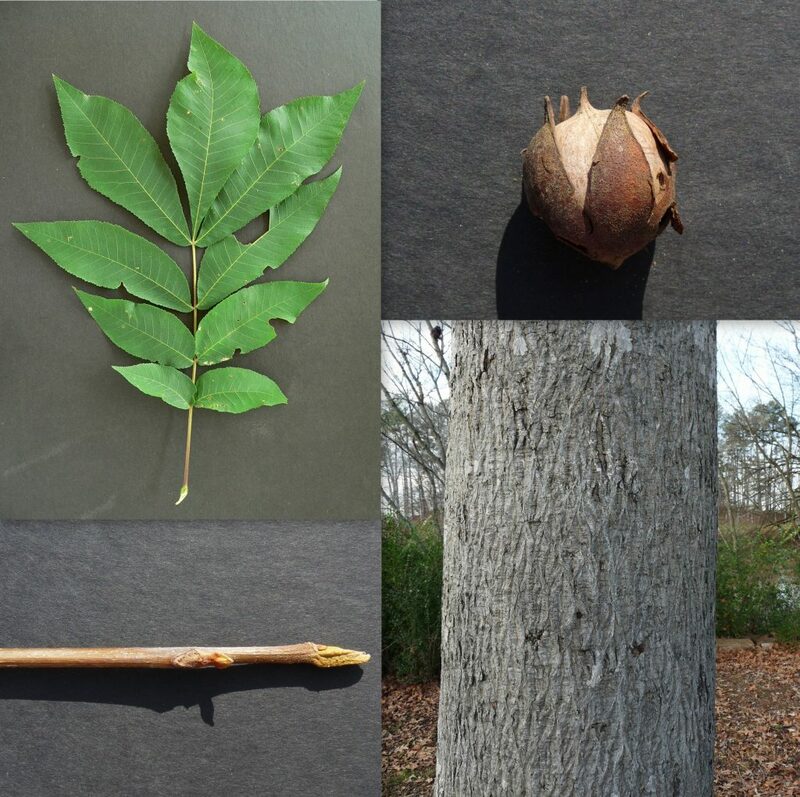 Hickory nuts are attacked by the hickory nut weevil, Curculio caryae, which can kill over 60% of the nuts, and by the hickory shuckworm (Laspeyresia caryana; Lepidoptera), (Burns and Honkala 1990; Johnson and Lyon 1991; White 1983). Seeds eaten by deer and rabbits (Martin 1951)..